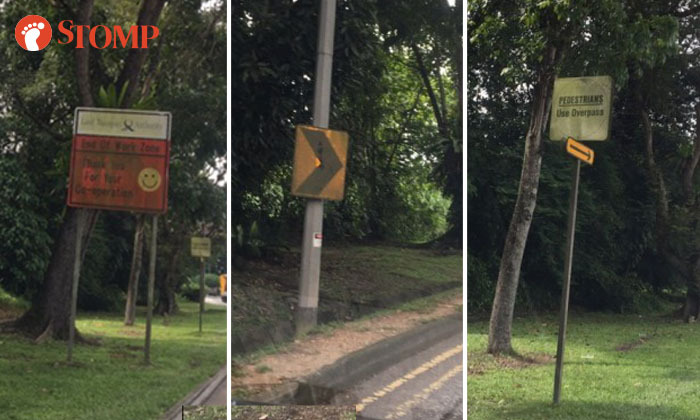 Stomper Hong was driving along Woodlands Road on Nov 12 when he passed by some road signs that had algae growing on them. He took pictures of the signs at about 2pm that day, but said he noticed the algae on them three months ago. He told Stomp: "I'm concerned about the safety of motorists, as visibility of the road signs will be limited, especially at night." In response to a Stomp query, the Land Transport Authority said on Nov 20: "The algae stained sign in concern is displaying 'End of Work Zone'. "These signs are typically provided at the end of the contract boundary to inform motorists that they have approached the end of the work zone. "This sign is not traffic related. Hence, please be assured that there is no safety concern for motorists or pedestrians." The LTA added that the widening contract along Woodlands Road that has been going on has been completed, and the signs there are redundant. The signs will be removed by the end of November 2018.